I was first introduced to the concept of “deep work” from a client. I was trying to schedule a meeting and noticed large chunks of time reserved on her calendar labeled “deep work”. Intuitively, I knew what that meant, but I had to find out the scope! 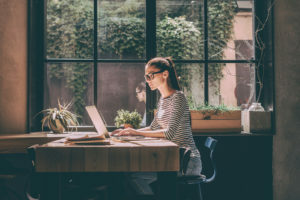 Deep work was a new strategy for her team to reserve portions of their day or week where they limited distractions, disconnected from email/text/phone/meetings and truly concentrated on one task. Brilliant! We have all probably done this at some point, but now I had a label for it! Deep Work: Rules for Focused Success in a Distracted World by Cal Newport breaks down the importance of intense concentration. He proposes a shift in work mentality—limit spending your time and energy on “shallow work” and focus on “deep work” instead. Truly carving out uninterrupted time in your day to solely concentrate on one item can be a game changer. Whether you’re an entrepreneur, student, executive or consultant, you probably have a lot on your plate right now. On top of never-ending tasks, projects, volunteer commitments, emails, meetings, and deadlines, you might even find it increasingly difficult to consistently produce high-quality work amidst living in our highly connected, extremely competitive, and distraction-filled world. #1 Schedule it! Carve out time on your calendar; block it out so others know you are not available. It is amazing how this simple trick works! #2 Create a “deep work” atmosphere. For me, this includes simply lighting a candle, moving my workspace to a different location (small conference room, outside, local coffee shop) or listening to instrumental music. #3 Reward yourself for “deep work” time well spent! You did it…you disconnected and spent true quality time on a deliverable or activity. Go grab that cup of coffee, reach out to a friend, head outside for a walk! You deserve it! OK, my deep work session is officially over. I’m going to take my own advice on #3 and go grab that cappuccino that has had me salivating for the past 90 minutes!